I saw on the news tonight that there is supposed to be a huge winter storm coming through. 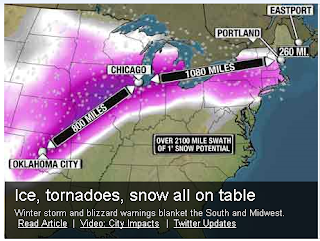 The people on the weather channel had me pretty worried actually. They were claiming this is the biggest winter storm to hit in about 15 years. Wouldn't it figure that it happens when I'm hundreds of miles away from my family. Jennifer told me she brought a big load of firewood inside, moved her van into the garage, stocked up at the grocery store, and got all the candles out in preparation for it. 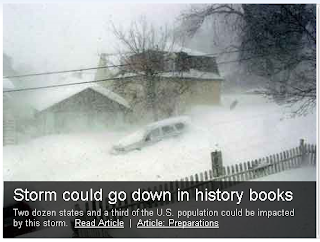 Oddly, here in Virginia it's a balmy mid-40's F. I do fear that it may get worse before I leave though. My flight is Friday morning, and I go through Philadelphia for a short jaunt. Given this route, I may be delayed and possible fight some cancellations along the way. Yeah, I'm not looking forward to any of that. Anyway, for now I'm enjoying a private stress free night here in VA hoping my girls get that snow day that they were so excited about over Skype tonight. :) Tomorrow brings some major weather for all you Ohioans, and I may wear a flannel to work, but no winter jacket will be necessary. Good luck and stay warm!